Love baseball? Love reading? Then you need this pack – simple as! 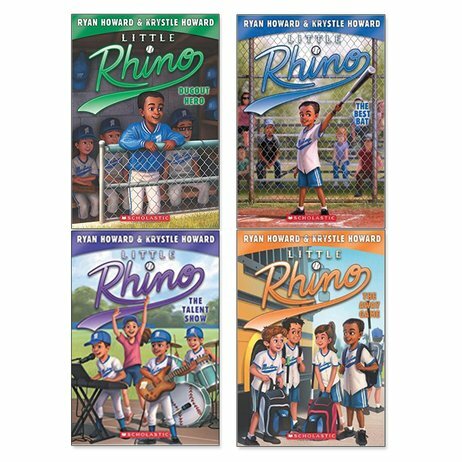 Amazing chapter books from baseball star Ryan Howard and his wife Krystle. Little Rhino lives and breathes baseball. He’s got the kit, he’s got the talent – heck, he’s even got the nickname! (His real name is Ryan, but Rhino is much cooler, right?) Every day when Rhino gets home, he finishes his homework, grabs his bat and glove, and runs outside to practise with Grandpa James. But while Rhino pretends to be a Major League homerun hitter, his grandpa has signed him up for an actual team! There will be victories, defeats, new friends and great games. Want the full story? It’s right here!